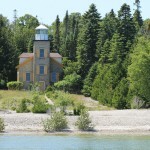 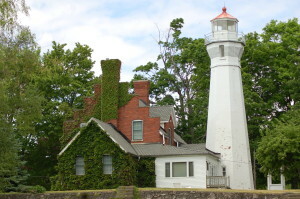 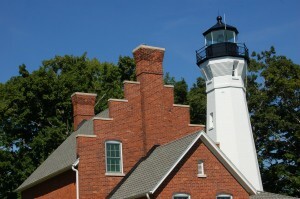 Michigan’s Lake Huron shoreline features more than 20 lighthouses – the Port Sanilac Lighthouse in the small village of Port Sanilac is one of the more uniquely designed beacons on this side of the state. 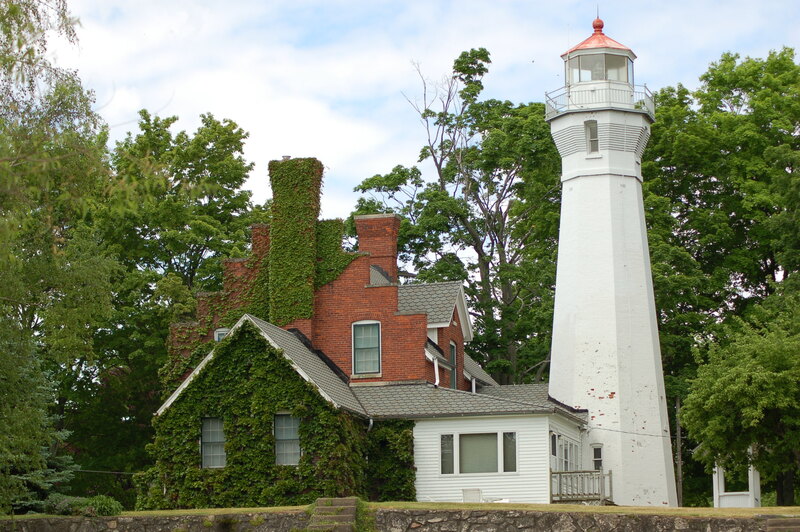 There was no lighthouse between Fort Gratiot Lighthouse (Port Huron) and the Harbor Beach Light when it was decided that the lumbering village of Port Sanilac would be a good spot for an additional light. 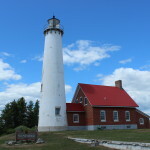 The waters of Lake Huron near here have many shallow spots and sandy areas that have been hazardous to maritime traffic over the years. 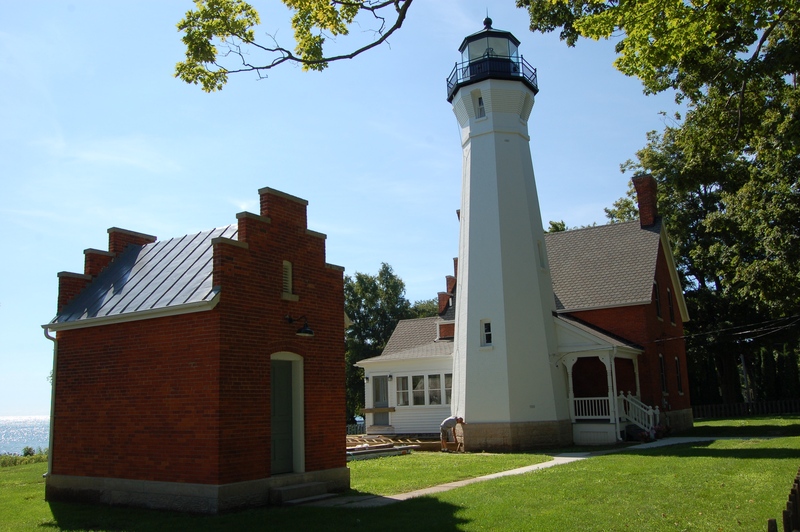 The design of the Port Sanilac lighthouse sets it apart from others in Michigan, as its tower has an hourglass shape with a wide octagonal base that slims down before getting wider right below the lantern room. 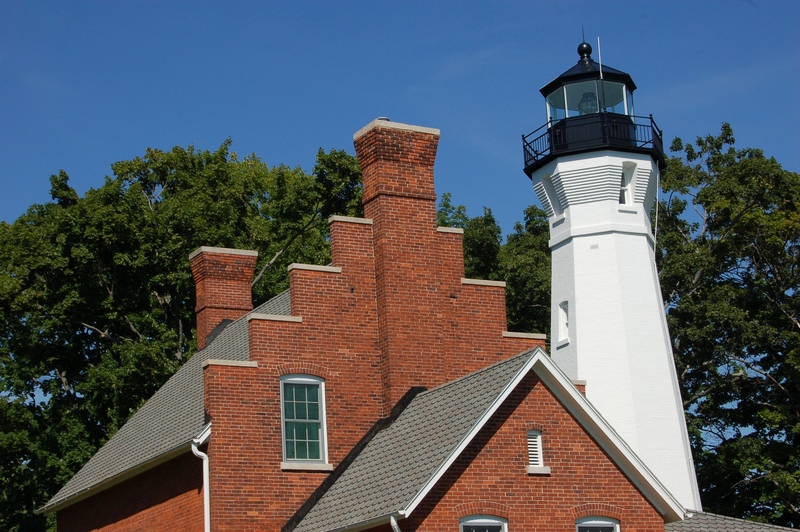 The lantern room is cast iron and while we found it painted red in our first few visits (1990s, 2012) on our two most recent visits it has featured a black lantern room. 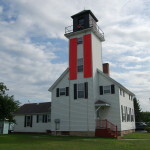 This lighthouse went into service in the 1880s and was automated in the late 1920s, today it is still an active navigational aid. 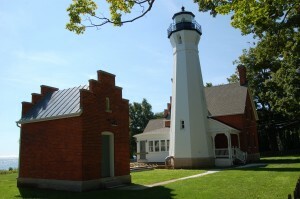 The lighthouse stands next to a two-story brick dwelling; a covered walkway connects the two structures. 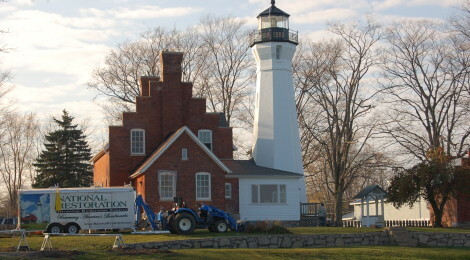 The brick oil house also survives, and the current owners appear committed to preserving and restoring this historic lighthouse. 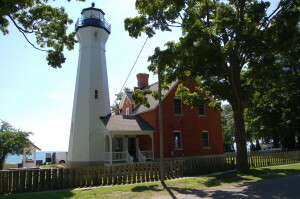 While it is not possible to set foot on the lighthouse property, great views of it can be found from a parking area nearby. From M-25, head east on Cherry St. and follow Cherry to its end. 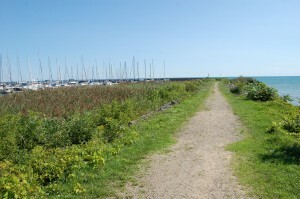 From the parking area a footpath leads out towards the lake (see below), and the lighthouse can be viewed from its perch on the high ground 130 feet from the water. The Port Sanilac Lighthouse is the sixth stop on our Ultimate Michigan Lighthouse Road Trip: Lower Peninsula. 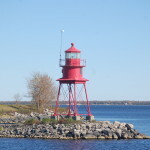 This area is popular for summer vacations, with great opportunities for fishing, boating, diving, golf and more.